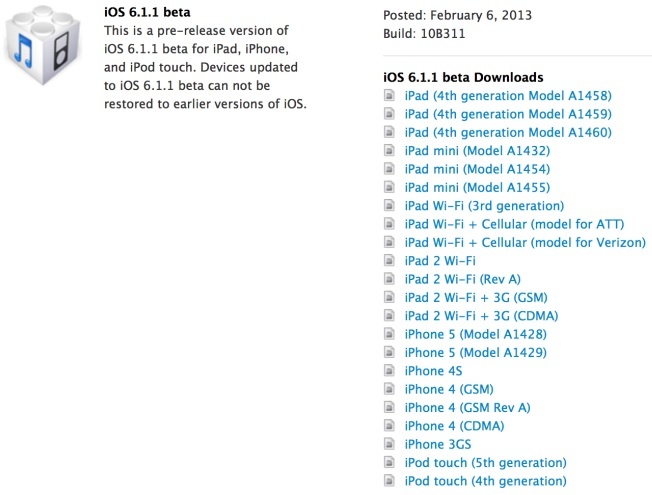 A little over a week after the public release of iOS 6.1, Apple today seeded the first beta version of iOS 6.1.1 to developers. The beta arrives as build 10B311. The new version also arrives just two days after the Evasi0n jailbreak for iOS 6.x devices went live, although it is so far unknown if iOS 6.1.1 patches any of the bugs exploited by the software. Update: 9toMac has release notes listing major improvements to Maps for Japanese users. Ah, the "jailbreak fix" release. I hope Safari gets snappier. These jokes were old about a decade ago. Please try your joke again. I really dont use the jailbreak. i only jailbroke because of NCSettings to be honest. Same here. I don't get all this excitment about jailbreak! I jailbroke mine and it's clearly not the same after that. Battery indicater does not show corrctly, drops like 10% each time, it's noticably slower, winterboard crashes!! I mean wtf? Isn't this the reason we like Apple products? So we don't have to cope with that crap? The first on the road to another lackluster update. Yeah, coz they shouldve released game changing features in this 0.0.x update. It's good to repeat that joke. Lucky thing it's still hysterical.